Yitzhak Laor, poet, novelist, essayist and playwright, was born in Pardes Hannah, Israel, in 1948. He received his PhD in theater and literature from Tel Aviv University, and writes editorials and literary reviews for the Hebrew daily Haaretz. In 1972, Laor was jailed for refusing to serve in the occupied territories, and his leftist opinions, expressed in his work, have continually nettled Israel's mainstream establishment. 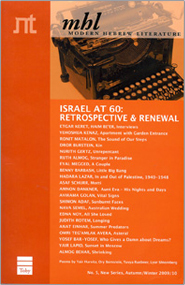 In 2005, Laor founded and became editor of Mita'am, a Review of Literature and Radical Thought, which was a major arena for intellectual debate. Laor has published many collections of poetry, as well as novels, short stories, collections of essays and one play. Among his literary awards: the Prime Minister's Prize, twice (1991; 2001), the Bernstein Prize for Poetry (1992), the Hebrew Literature Award (1994), the Moses Award (1998) and the Amichai Poetry Prize (2007).